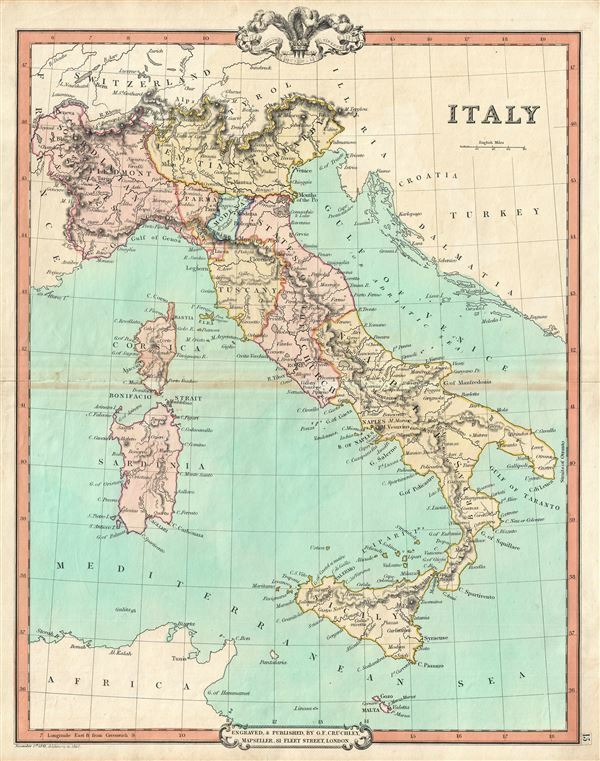 This is an attractive 1850 map of Italy by George Frederick Cruchley. It covers the pre-Garibaldi Italy split into numerous small duchies and states from Venetian Lombardy south to Sicily and Malta. Also includes the islands of Sardinia and Corsica. The map is color coded according to duchies, with relief shown by hachures. Cities, towns, rivers, mountains and other topographical features are noted. At this time in history, the peninsula was undergoing Risorgimento, Italy's march toward national solidarity. Following the defeat of Napoleon and the merging of Sicily and Naples into the Two Sicilies, the Island of Sicily witnessed revolts against the Bourbon rule in 1820 and 1848. The final revolution in 1848 resulted in the island gaining independence from Bourbon control for 16 months.